My studio and on location photography is meant to be an alternative to the big box retailers. I want to deliver high quality portraits to you minus cheesy backdrops, forced smiles and a rushed atmosphere. The studio is a full fledged and spacious professional set up with backdrops, a private changing room and bathroom. There is a viewing room for after the shoot image review. I book by appointment only. It is a residential studio so there are no lines and no on lookers. I'd love to discuss your next portrait session. Contact me via the methods listed below. Email: Please fill out our Contact Form with any questions regarding our services. For wedding and engagement photography, we recommend you visit Northwest Indiana Wedding Photographer - Region Weddings. Chicago Theater at night with traffic blazing by. We had our first truly warm weekend and I had no client work scheduled so I hit the streets of Chicago for some night photography. I am mainly a wedding and portrait shooter, but I have found that doing other types of photography helps me to step up my game in other areas. Hey, you never stop learning!! Building lights reflect off of the Chicago River at night. These type of "nightscapes" require a tripod and a whole lot of patience. the above image was taken on a bridge with the camera securely mounted. However, it's still not as sharp as I'd like it to be because the bridge I was on had much traffic on a Friday night and there was some shake. However, this was my only choice for this vantage point. I suppose I could have come back at 4am or something when there was less traffic. The streaks of light you see in these shots (and especially the Chicago Theater image) are the result of headlights and taillights from moving traffic. The shutter is so slow that the cars themselves became invisible. 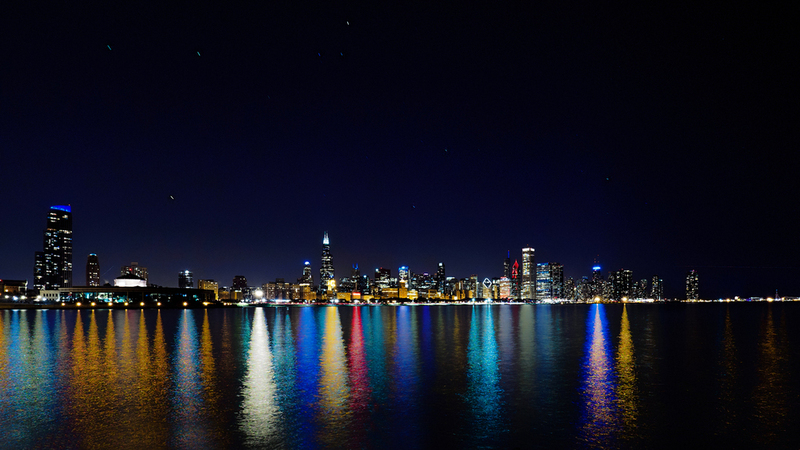 Chicago Skyline from Lake Michigan at night. I have a workshop coming up on May 21st that will cover Mastering Settings on your camera and then we will do an outdoor portrait session with a model. While this will NOT be a class on night photography, we will discuss the basics of shots like these. I am considering a class in Chicago doing night photography such as this. I will just have to see how much interest there is. To learn more about the upcoming workshop and to sign up before the $50 discount sale ends at the end of April, check out the info below. Happy shooting!! I'm happy to announce that the 2016 Northwest Indiana Outdoor Portrait Photography Workshop will take place on May 21, 2016. So, who is this class for? While anyone could benefit from the knowledge in the class, it mostly centers around interchangeable lens cameras and using them to take portraits, event photos and more. If you are someone who is using a point and shoot camera, but want to make the jump to something more advanced, this class will help you as well. Also, there are many fixed lens high end cameras out these days as well, the Fuji X100s come to mind, that would also be perfect for this class. So don't let the description scare you out of attending. However, it's not a "how to use your phone camera" class either. Here are a few FAQ's in addition to all of the info you need below. Will I get to shoot at this class? - Yes, in the afternoon we will go outside and I will have a model on hand to pose for us. We will shoot natural light, use reflectors, use my flash (I will provide the gear) and take turns creating images. What if it rains? - Photography is all about thinking on your feet. If weather is bad, we will shoot inside the cafe where the classroom portion is being held. Is this a "real live professional model"? - I can guarantee that the model will be alive. However, this isn't a bikini clad, Victoria Secret type of shoot. Our model will be a normal everyday person. Will you show me everything I need to know about the menus of my camera so I don't have to read the manual? No. While I can certainly get you going and shooting and you will walk away knowing far more than when you came in, I won't have the time to go through every persons particular camera inside and out. Is there any special brand of camera I need? Absolutely not. One of the myths of photography (besides megapixels) is that certain brands are better than others. They are different flavors of the same delicious pastry - all delicious!! Should I bring a notebook? I think that is a good idea. However, a PDF will be made available after the class for download and will have much of the information discussed. If you have any other questions, please fill out the Contact Form and ask away. I will try to get back to you in short order. You can purchase the class at the link below. NOTE: The class is currently on sale. Thanks! !